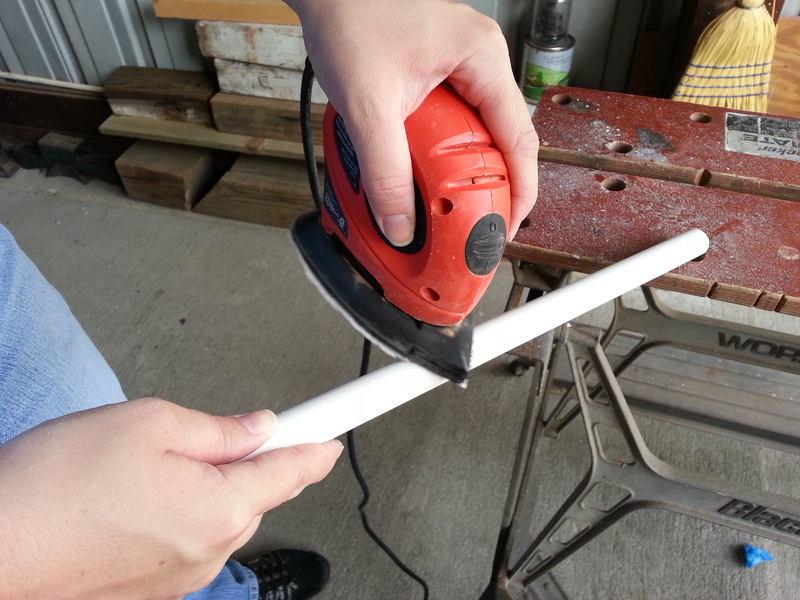 Cut PVC pipes using the above guide. I used my Nextel saw and painters tape to ensure a straight line while cutting. Smooth rough edges and sand markings off pipe. 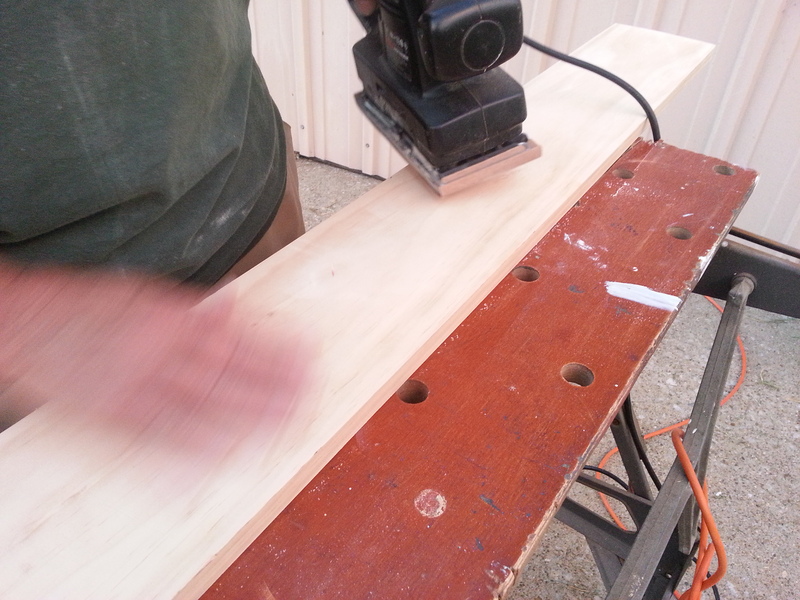 Do this by hand or machine using 200 grit sandpaper. Sand all surfaces if planning to paint it. Wipe surfaces clean and put together. 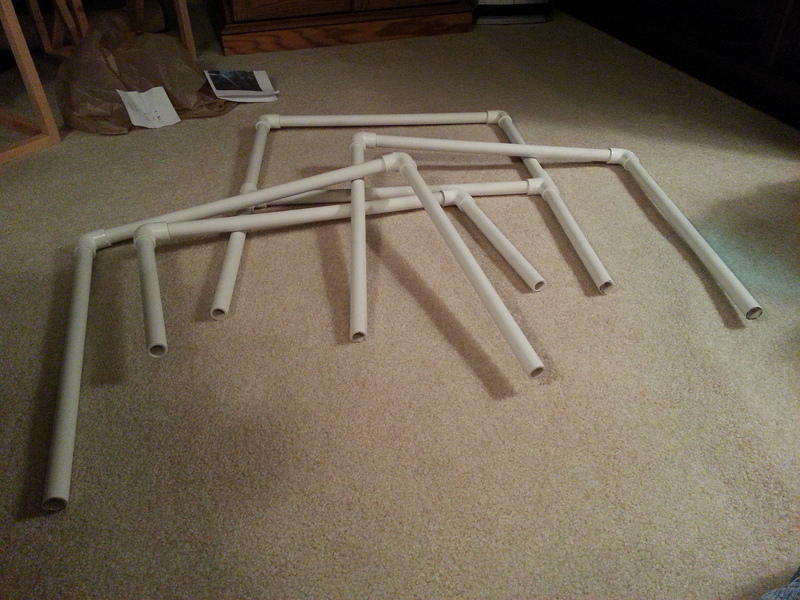 For the bottom frame, construct each side by using three 14″ pieces together with 4 “T” joints. Add a 2″ piece to each end and place an elbow piece on each end (one side will face left, and the other side will face right). Connect elbow pieces together with an 18″ piece. For each of the 18″ racks, make an inverted “U” shape with three 18″ pieces and two elbow joints. For the 24″ rack: To make each side, join two 11″ pieces with a “T” joint and connect an elbow piece on the end. 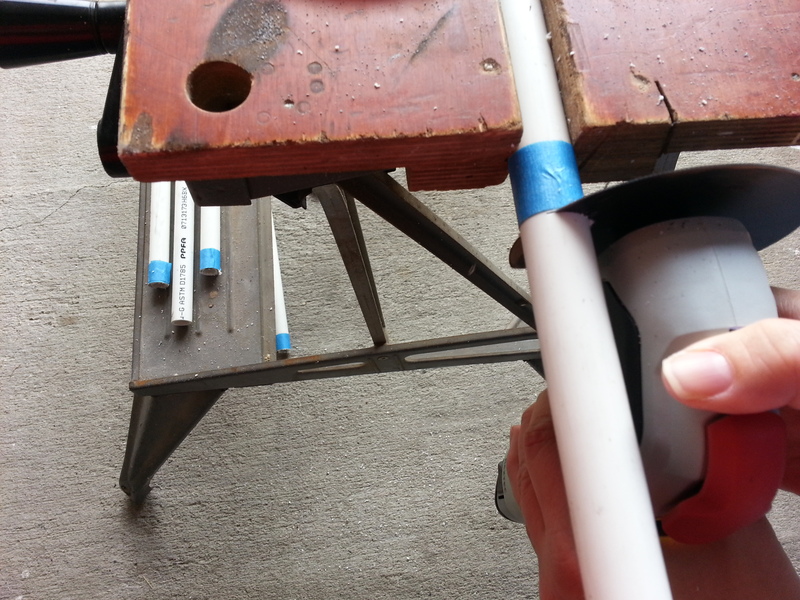 Connect the “T” joint and Elbow pieces together with 18″ piece on the top and the 17.5 at the “T” joint. 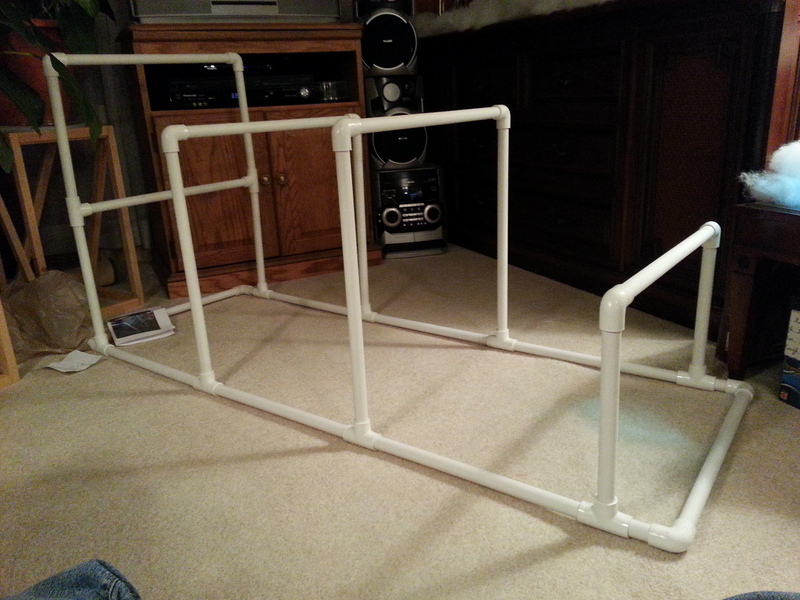 For the 10″ racks, make a “U” shape with two 10″ pieces and one 18″ using two elbow joints. Connect each of the racks to the bottom frame sides. The size I made mine ended up being a bit bigger then I would use in day to day life, however if you have a lot of clothes this works great. 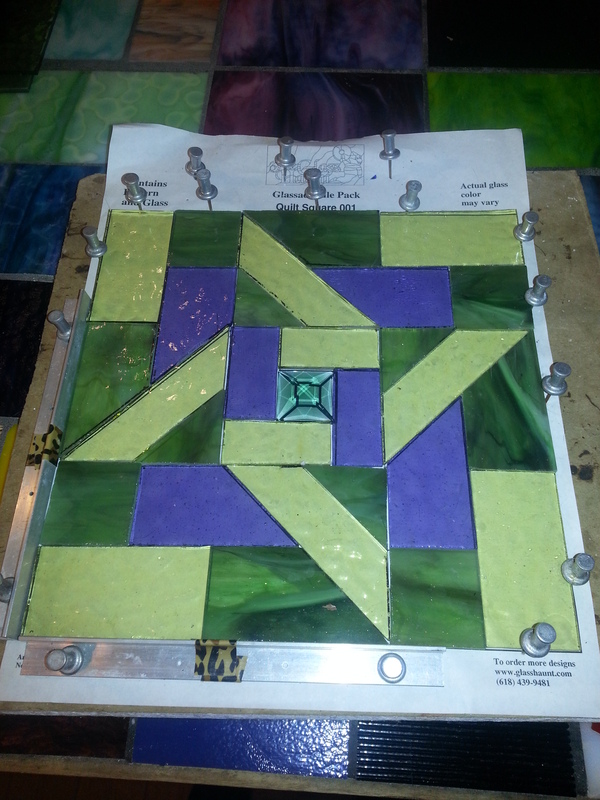 To make it smaller, you can make the bottom side pieces 12″ instead of 14″. However, height needs to be at least 16″ to hang outfits and at least 9″ for separates. Marking the pieces would also be a good plan for quick assembly. I think I will work on some kind of carrier/bag for this. But at least it will break down into a tote easily for hauling. Evie helps put the clothes rack together…sort of. 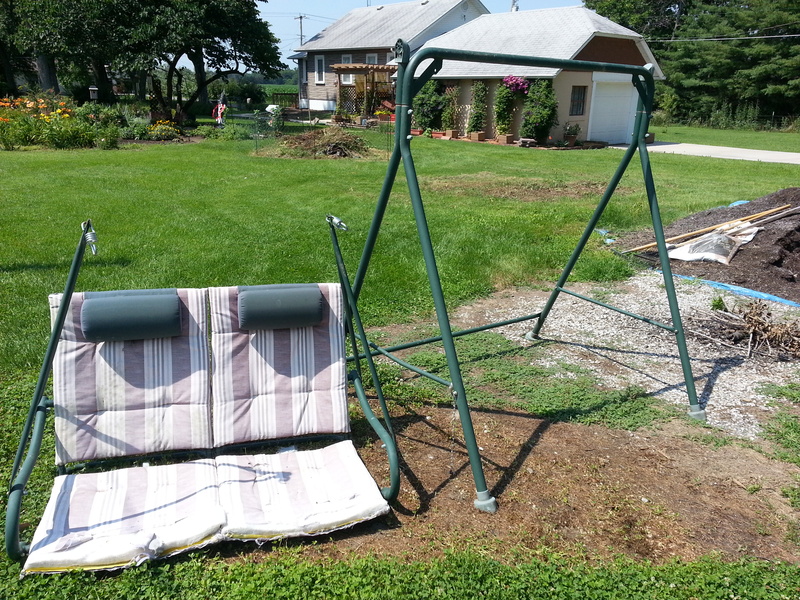 That worn piece of lawn furniture, sun, rain, wind – it has seen it all. And then the day comes where it is moved from a place of prominence to the far side of the yard, under the wisteria, and then finally a shed to dry rot and eventually be thrown away. Not this time, not today! So we carefully cut off the cushions and took lots of pictures in case we wanted to redo them. They were then set aside and we broke out the paint. 2014 “After the fact thought” Use a medium grit sandpaper lightly over the frame so the paint will stick better to the frame. Otherwise it might scratch off easily. After cleaning off the frame and letting it dry, we decided to use a heat resistant spray paint in a semi gloss black. 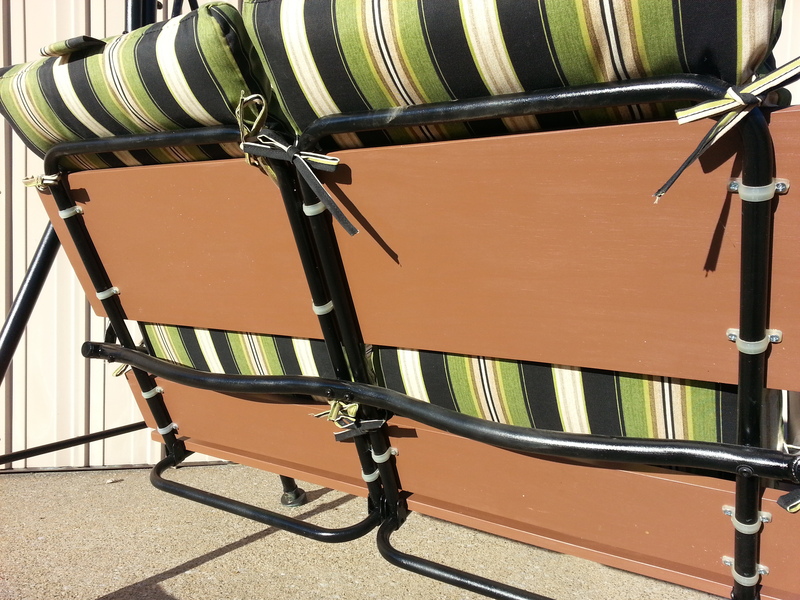 This worked really well for my bistro table and chairs last year, so we decided to make it all match. We painted the frame and seat separately, it took two coats to get the right finish. After it was dry to the touch we hung the seat back on the frame and touched up any places we missed and then set it in the barn to dry. We then sprayed it with a clear finishing spray to make it more durable. So pleased on how it looks! Almost like new! So in the weeks after we painted the frame, we pondered what kind of cushions to make. 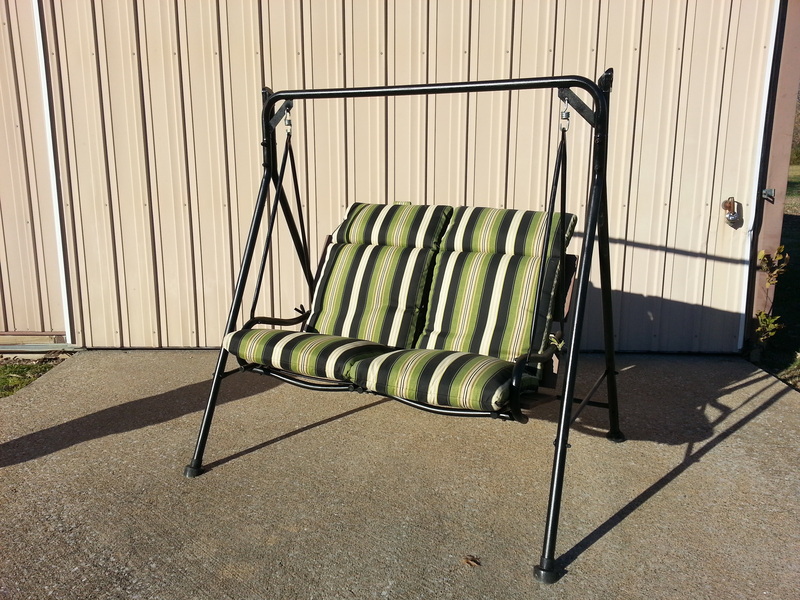 We decided early on that we wouldn’t put the cushions back like they were, the frame would have to be further disassembled and we liked how the cushions were removable on Mom’s new swing. So ‘to make’ or ‘to buy’ cushions. I wish I could say that we made cushions, I know you want me to say we made them – but alas no. We decided if we found some quality cushions we liked, it would be much cheaper than making new ones. It also helped that we didn’t see any outdoor fabric that really wowed us at a price we were willing to work with. This is a secondary swing after all. So during a shopping trip to Paducah (where we made our executive decision about the make vs. buy), we stopped by our local Menards on the way home. Now I’m not a big Menards fan (I’m sorry Marion), but we did find something we could agree on! 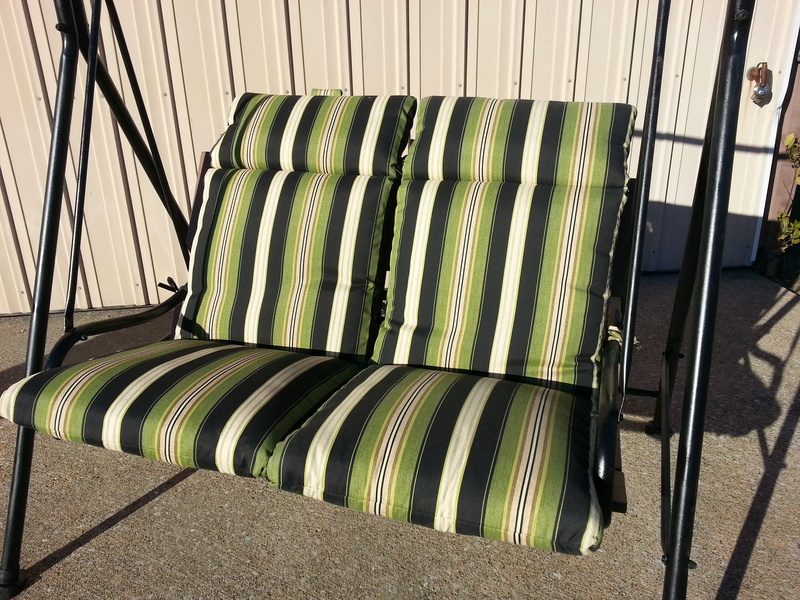 It was part of their replacement chair cushion line and it had a striped pattern that contained black (to match the frame), tan (to match the deck) and green – so it was pretty perfect! The one down side is that they didn’t have a cushion for our swing, so we had to buy two chair sets and some accent cushions (to tie into the bistro set and the other swing). What about wood? What about wood indeed! Once we settled on the fluffy Menards cushions, having wood for the frame didn’t seem like a bad choice. Real or fake wood, the eternal question. After chatting with a guy from Menards (with a huge Napoleon complex – yes fella, us ladies can use tools), we opted for real wood because of the widths we needed. 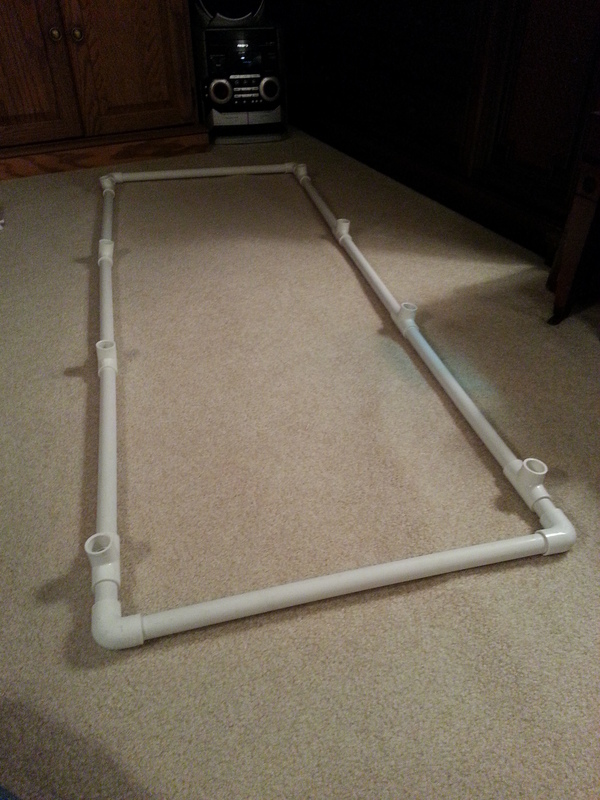 We measured the frame and decided an 8ft piece of 1×12 and 1×6 would give us the coverage and support we needed and the flexibility of working around the frame. We are an equal opportunity home improvement store buyer, so we got the wood at Lowes (it also helps that they cut the wood so it fit in the car). White pine with no knots was the wood of choice for this and it was really easy to sand down the corners and edges (go Mom go!). Afterwards we wiped them down with mineral oil to pick up the dust. Let dry. Another perk of using wood is that it could also be stained to match the deck! Off to ACE to buy some rum raisin stain. 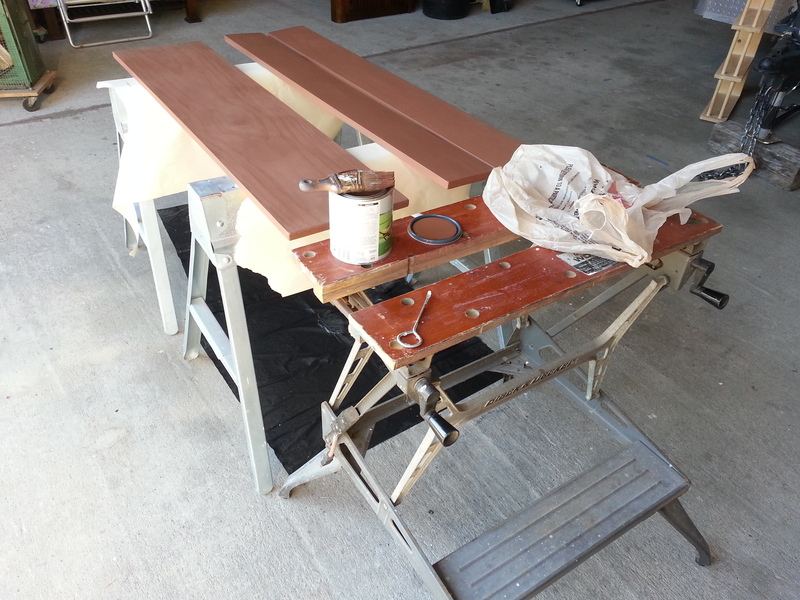 We then set up work space in the barn on a dry day and put two coats on all the boards. This took a couple days to ensure proper drying. 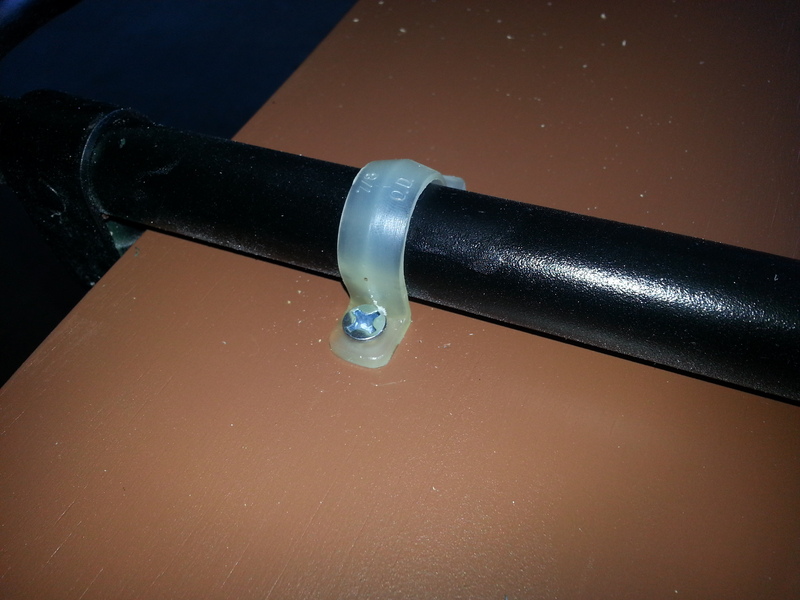 To mount the board to the frame, we used these connectors that are normally used to attach wiring or tubing to walls. These measure 7/8 and are made of plastic. We used two brackets on each end of the board (about 3.5 in from the edge) and two brackets in the middle for support. 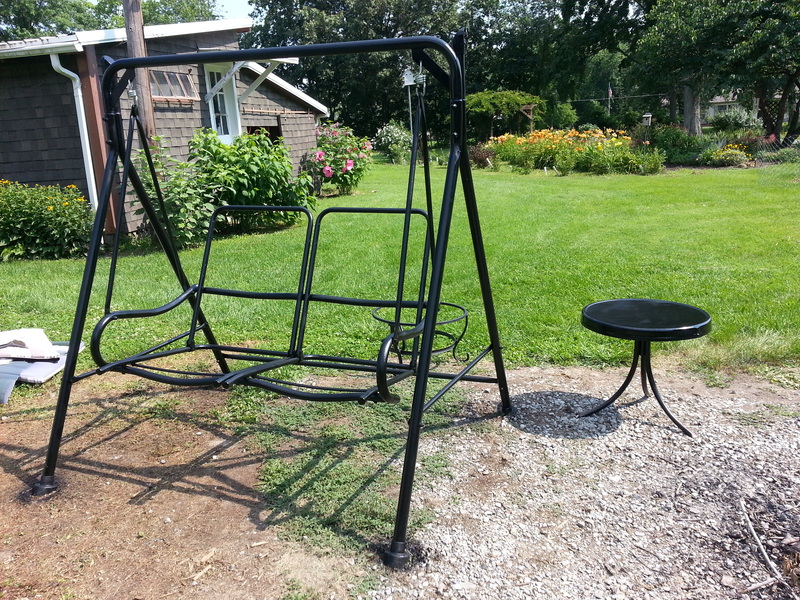 Here is the finished swing! So pleased on how it turned out and it will look great next spring. So there is a place in Benton called the Glass Haunt. My earliest memory of this house was from elementary school and walking past it on the way to the 4H petting zoo day at the local high school. Of course we drove past it countless times, but walking past was the first time I really noticed the beautiful brick home with its winding driveway and the iron benches that sat under huge trees in the front yard. During high school, this house went up for sale and Mom picked me up one random lunch hour with a ‘if you want to see this house you better get in the car’ mission. The furnishings were long gone, but the mission style interior was lovely and intact. The house eventually became a health food store and then a few years later the Glass Haunt. I’ve always been fascinated by stained glass, perhaps for the same reason I like jewelry or why I was an Art History major. Physical colored light. So I wanted to try it for myself, but was weary on taking on yet another craft. However, curiosity got the better of me and I went in a couple times to meet the staff and gauge if I wanted to take it on. 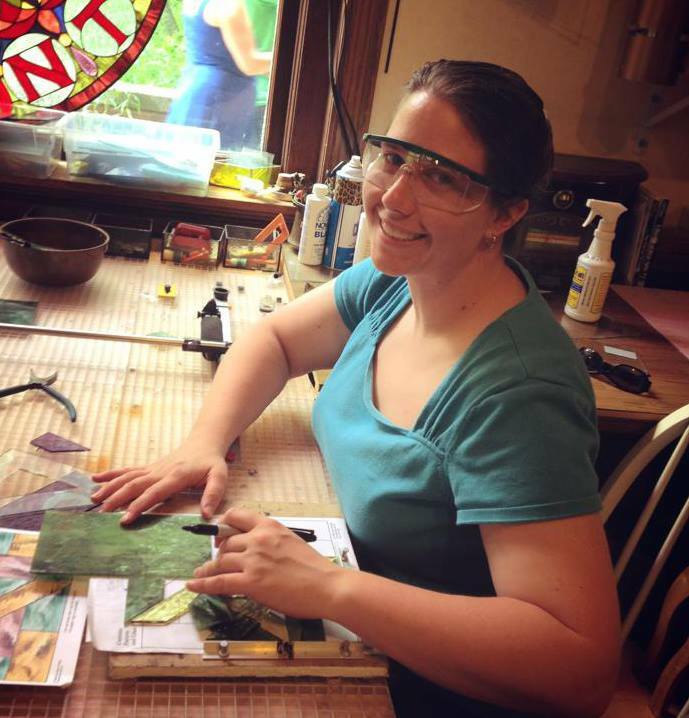 Being underemployed at the time, the time and cost were things to consider, but after steady employment was secured and during a visit with my good friend Audrey in May, we went to one of the open workshops to try our hand at it. We opted to work on a pre-designed kit with a quilt block pattern. I thought this would make Mom a cute birthday present. 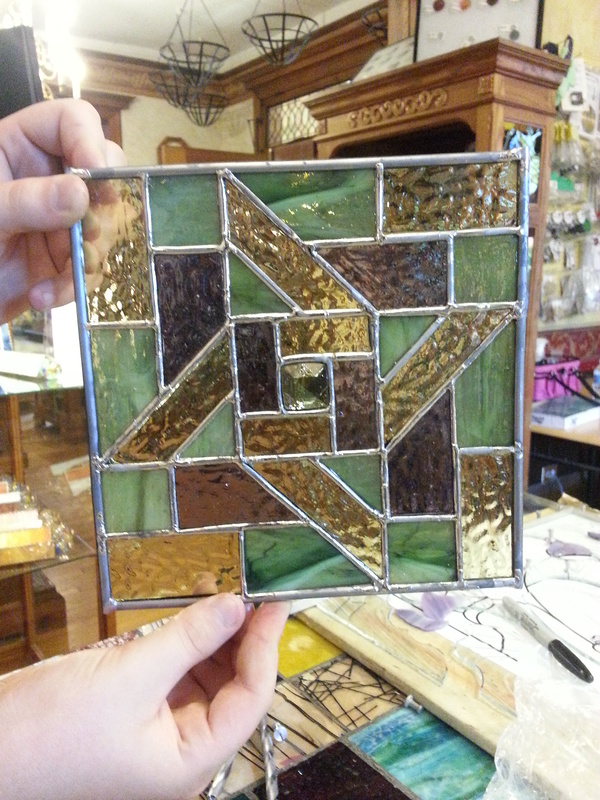 We were walked through the process and spent the afternoon cutting glass to fit the pattern. It reminded me a lot of sewing – definitely a measure-twice-cut-once activity. The glass was surprisingly easy to work with, and it was inspiring to see all the different projects being worked on. We were the obvious newbies that day, and it was exciting to see the advanced projects. Everything from full windows to sun-catchers. The kits we picked out, which I thought would be quick since they had straight lines, took quite a while to cut out, so that’s pretty much all we got done on the first day. My block was composed of purple, green and yellow. Audrey opted for blue, green and yellow. 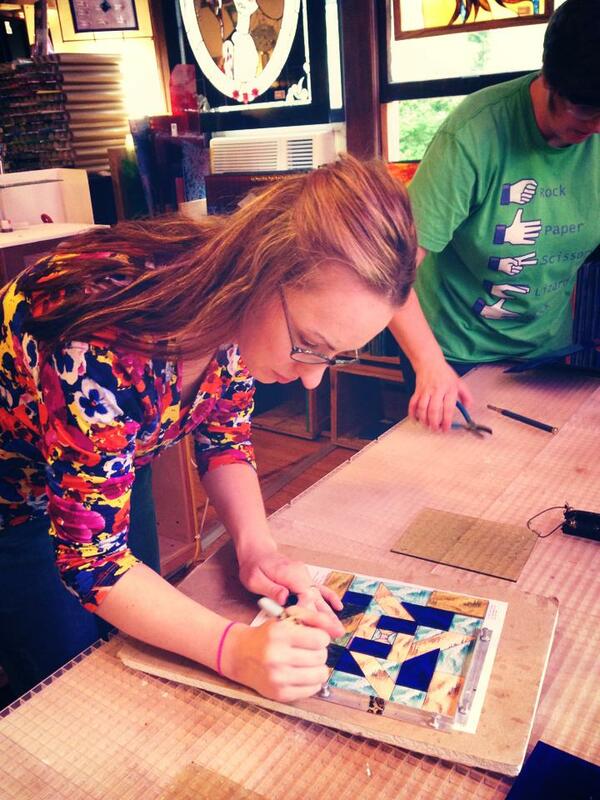 She’s pictured at right measuring pieces based off the print-out pattern. Though glass is easy to work with once you know how, it’s important to cut the glass a certain way so you won’t get hurt. Everyone had their story and ‘war wound’ to share and Audrey got hers on a corner piece at the very end of the day. Bandage time! It didn’t crimp our fun and at the end of the day we put our stuff with the other student projects and continued with our weekend of Shakespeare and fun in St. Louis. Toward the end of June I returned to the Glass Haunt to continue with my project. I really wanted to get this done for Mid-August and with a busy July ahead of me I needed to get crackin’ to get this done. 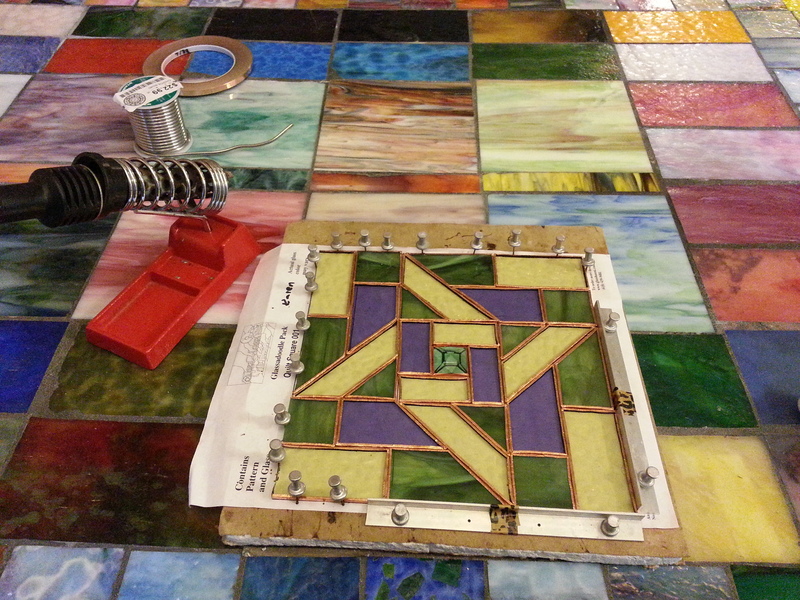 I finished grinding the edges of the pieces and ‘foiled’ them to prep for soldering. It took several hours to get all the pieces to fit just right, but I was pleased with the result. That Saturday was a slow day and for the most part I was by myself and got to work one-on-one with the shop owner, Ruth. That’s right, week of Mom’s birthday. How did I run out of time? I had a Wednesday afternoon before Mom’s b-day free and so I checked into the Glass Haunt to get my project done. On to soldering! I think this ended up being my favorite part. Once you got the hang of it, soldering can go pretty quickly. I had a hard time remembering to use the Flux at first, but it was easy to fix the problem areas and move forward. 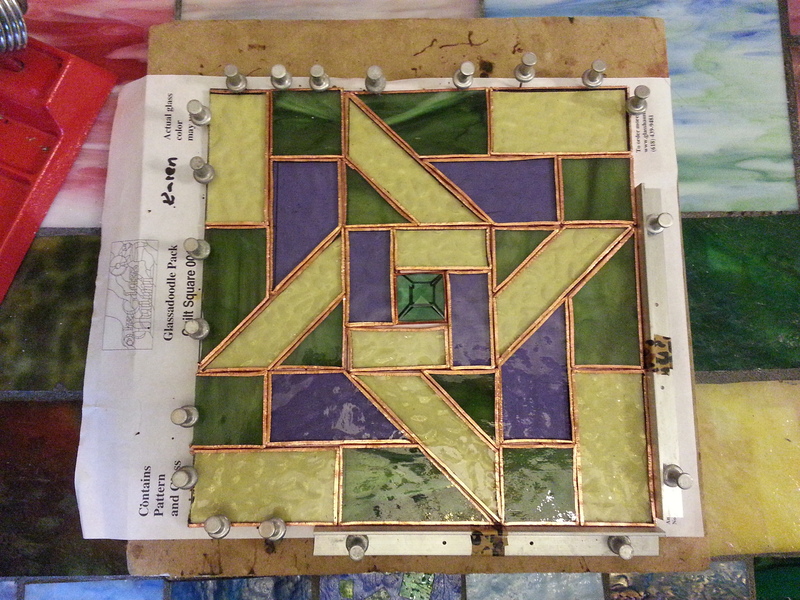 I started with the ‘front’ of my piece and flux/soldered in sections, covering all the copper foil with lead metal. Don’t touch the molten metal! Then you put the border metal on and solder the back and all the corners. The back didn’t come out as well as the front because of air bubbles that form where the pieces met. Will have to be more careful and slower next time. After everything is soldered, you clean off the flux and then burnish the metal to give it a uniform look and wax to give it some shine. We debated on how the piece should hang and decided to hang it from one of the corners. So we attached some lead loops for hanging. So over the course of 3 days, the project took around 12 hours. It was satisfying to complete and I look forward to my next project, esp since I have all kinds of supplies now. Audrey needs to come back soon to finish hers!! So I came across some yarn a few weeks ago and decided to work on some 18in doll hats in the off-season. This may or may not be related to my new subscription to Netflix. Movie and Crafts!! Mostly snug to the head and beret style caps, although Mom is requesting one with a brim, so we’ll see how that will go. For all of these hats I used a “H” size hook and regular weight yarn. More pattern variations on the way! 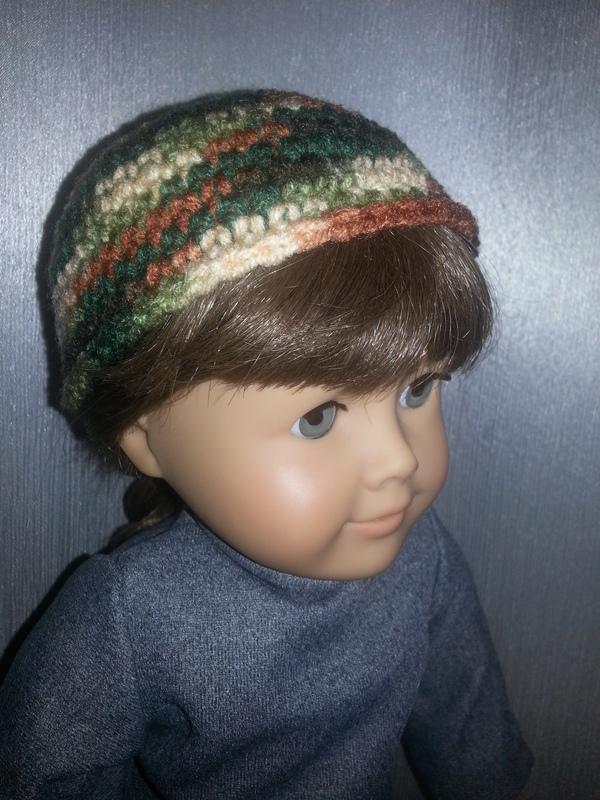 The first hat is a snug sock cap and inspired by one of the yarn skeins in a camo color. It’s not a color scheme I normally work with, but thought it would go over well in the rural area where I am currently living. So I worked out a pattern. Having the doll handy is helpful for sizing. Tension gauge is about 4sc = 1 in, 5sc rows = 1 in. sc 2. dc in first chain and make 11 more dc in the same hole. sls to make a circle. Chain 1 and sc in first chain. 2 sc in next stitch, 1 sc in next stitch and repeat to complete the row. sls to finish the round. Chain 1 and sc in first stitch. 2 sc in next stitch, 1 sc in next stitch and repeat to complete the row. sls to finish the round. Chain 2 and dc in first stitch. 2 dc in next stitch, 1 dc in next stitch and repeat to complete the row. sls to finish the round. Chain 2 and sc in next 3 stitches. 2 sc in next stitch, sc in next four stitch, and repeat to complete the row. sls to finish the round. Chain 2 and sc in first stitch. sc in each stitch to complete the row. sls to make finish the round circle. Chain 2 and dc in next 3 stitches. 2 dc in next stitch, dc in next four stitch, and repeat to complete the row. sls to finish the round. Chain 2 and dc in first stitch. dc in each stitch to complete the row. sls to finish the round. Turn hat to where the tail end is inside and flip up row 11-14 to make the brim. Kat’s Corner Attic on Facebook!